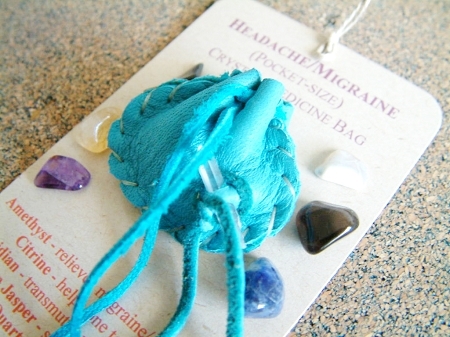 The "Headache/Migraine" Crystal Medicine Bag (CMB) contains a collection of beautiful and powerful gemstones specifically selected to help you ease your tension or migraine away. It has a strong healing energy. 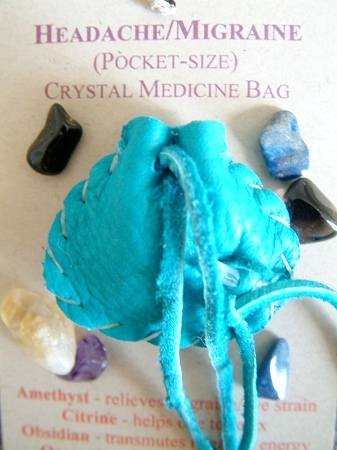 The beautiful butter-soft deer leather pouches were handmade by a lovely couple in a spiritual home and they each have a clear quartz crystal in front to amplify the healing power of the gemstones inside the pouch. One of the unique attributes of the CMBs is that they are very small (1 1/2" x 1 3/4") and light. You can tuck them anywhere! They are the ideal size to put under the pillow or in your pocket. You can use one or several together. We use high quality mini gemstones that measure anywhere between 6mm to 12mm, depending on the gemstone. 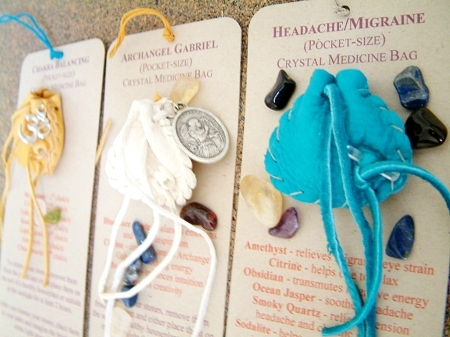 They are all unique and size doesn't matter when working with gemstones because they all have the same powerful healing energy that emanates from them and go where healing is needed. We welcome questions about our CMBs and love to hear from our customers!